A lifelong fan of fantasy, and romance, Ruth Frances Long studied English Literature, History of Religions, and Celtic Civilization in college and now works in a specialized library of rare and unusual books. 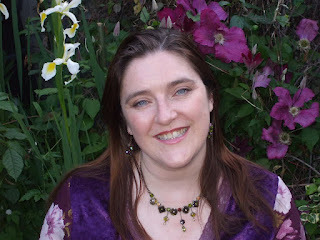 Her fantasy novels and novellas, including The Scroll Thief and Soul Fire, have been published by Samhain Publishing in the United States. Her forthcoming book The Treachery of Beautiful Things, published by Dial Books (a Penguin (USA) imprint) on 16th August 2012, is her first novel for teens. Keep going. Don't stop. Get the end of your manuscript. Then you can go back and fix it. A first draft is never perfect (I'd be highly suspicious if it was). The process is like a sculpture - you start off by carving a basic shape and then refine it and refine it witheach edit. Tough to choose just one but I'll go for The Grey King by Susan Cooper - magic & Arthurian legends in modern Wales. Where did you get the idea for The Treachery of Beautiful Things? Really the idea came from Jenny herself. I had the idea of a girl approaching a small copse of woods, but being too scared to go in. She was so sad and I wanted to know why. I also love English folklore and wanted to explore it myself. Did you hit any snags while writing The Treachery of Beautiful Things? What were they and how did you fix them? The scene at Wayland's Smithy was probably the most tricky. I had been there and to The White Horse of Uffington as a child and was basing my writing on those memories (the place really made an impact). But the technical parts of it - how to get form one to the other, which way the chalk horse faced, what the place smelled like... they weren't clear. I used Google maps, queried friends on twitter and by email, and contacted The Friends of the Ridgeway, a society dedicated to preserving the heritage of the area. And in the end we had a family weekend away and visited it. It was truly magical. It's such a beautiful place, and if old gods linger anywhere, it's there. 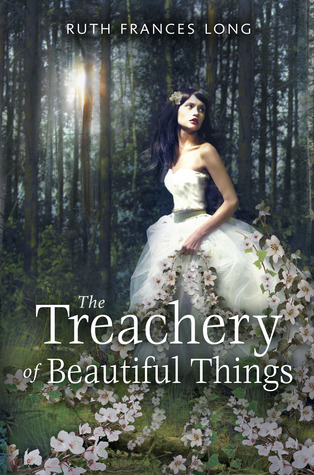 Which one of the characters in The Treachery of Beautiful Things is your favorite and why? Jack. How could I not love Jack? I've always wanted to write, or at least to tell stories. I almost gave up but persevered. And at my lowest point I sold my first short story to Hadley Rille Books for the Ruins Metropolis Anthology. So I am the prime example of never giving up. I'm looking into the possibility of a sequel, but nothing has been decided as yet. While The Treachery of Beautiful Things is a stand alone story, I feel there is a lot that Jenny, and particularly Jack, have yet to say. I LOVE faeries! Tell me, did you fashion your faeries from existing faeries or did you make up your very own? Mostly they are existing fairies, sometimes with a different twist. I wanted The Realm to be the place where our fairy tales and legends come from, so there had to be a mix of fairies from everywhere. It was a challenge to combine them all, but I love the effect. I also needed to make new twists on the older stories. And as I wrote about fairies, it seems fitting that more traditional fairytales, like Snow White and Cinderella started to creep in between the words, while I wrote. You live in Ireland! First I'd like to say, I'm totally jealous. I've been there and they had to peel my fingers out of the sod to get me to leave... Anyway. Second, I have to ask: Living in what many consider the "heart" of the faerie realm, have you had any experiences with the fae? Would you ever want to? Or are they just things that get put in stories? The belief in fairies is still pretty strong here. Even though people will tell you its just stories, just made up, I doubt you'd find many people willing to walking into a fairy ring at night, or move a fairy stone, not when it actualy came down to it. Though people might publicly profess not to believe, old habits die hard. We still have stories. I can't say I've had definite experiences, but there are places--mountains, forests, hidden valleys-- where you can certainly get the feeling that they're near. Will you be doing an American tour for your book? If so, where would you like to visit if you have some free time?